Polenta is made of cornmeal (ground corn) and water, and it is a staple carbohydrate food source in Italy. It is used in a variety of ways, as it is very versatile and cheap. 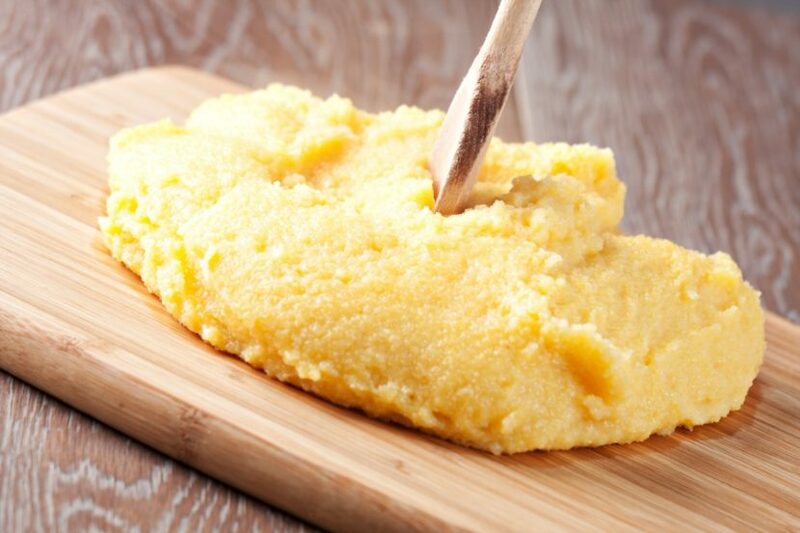 Traditionally, farmers in Italy eat polenta regularly as a routine diet as it is a good source of carbohydrate. It is usually cooked as a paste-like mixture, which is later served as a side dish as a part of a savory meal. However, if it is left to cool down at room temperature, it will eventually harden and stiffen to a cake-like texture. Italians often used leftover polenta like this and deep-fry it in slices to make it a crispy chips-like snack the next day. One can liken the use of Abario rice to this. It is used to cook risotto, while the left-overs are used the following day to make Arancini (deep-fried risotto balls stuffed with vegan cheese, served with a tomato based sauce). Don’t be surprised to see polenta cakes too. It is not uncommon for pastry shops in Italy to sell polenta cakes. Often combined with fruits such as raspberries, orange, and cranberries, they can be sweet and tasty as well. Do check out Jenny Mustard’s simple and easy-to-prepare polenta recipes if you are craving for some! Enough said. I’m drooling already.